There are some electric panels that were installed several decades ago that have since been discovered to be inadequate or unsafe. The following list includes some of the older panels that are known to be problematic. Zinsco panels stopped being manufactured in the 70s due to design flaws that resulted in circuit breakers melting and posing fire hazards. In some cases, the circuit breakers looked like they flipped, but were in fact still allowing power to flow. Fuse boxes are something from the past. Instead of circuit breakers, the electricity flowed through fuses. Unfortunately, fuses were only designed to handle 30 to 60 amps of power. In today’s world, our appliances require anywhere from 100 to 200 amps or more. Fuse boxes are likely to be overloaded often and you may discover you are replacing fuses often. Some may assume they will just use bigger fuses to compensate, but this is a dangerous choice. Using bigger fuses when the box was designed for smaller fuses can result in overloading and overheating. This can spark a fire. Another major risk with fuse boxes is the fact that while changing a fuse, you could accidentally stick your finger in the slot where the fuse goes and end up with a life-threatening electric shock. 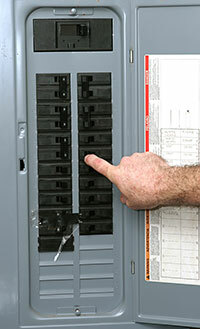 Pushmatic panels are known to be lacking a main breaker that allows you to cut power with the flip of a single switch. The panels also have a problem with breakers tripping and not wanting to be reset. The breakers are likely weak and will not stay on. Because the issue is so serious, the state of Florida brought a lawsuit against the company due to the lack of testing and safety violations in relation to the manufacture of these electric panels. If you know you have one of these panels give us a call to get a 200 amp panel installation or 100 amp panel installation. If you are not sure, call us and schedule a home safety inspection where we can tell you what kind of panel you have as well as if it should be upgraded or replaced. When Should I Upgrade My Electrical Panel? Is my panel too small? How Much Does a Panel Upgrade Cost? If you have heard about electric panel upgrades and are wondering whether or not you need one, this information will help you make a decision. There are 2 main reasons you should upgrade your panel. The panel is too small and not keeping up with your electrical needs. The panel is unsafe and is at risk of causing a fire or causing an electrical shock. The best way to explain an electric panel is to compare it to a tree. Your panel is the trunk and the breakers are the branches. The electricity from the power company flows into the electric panel, which distributes the electricity to the various breakers much like the roots of a tree gather nutrients and water and go through the trunk and throughout the branches all the way to the smallest twigs. The electric panel moderates how much electricity flows to each branch. If too much power were to go through, wires would melt and it could possibly start a fire. If you happened to touch a melted or damaged wire, you could receive an electric shock. The electric panel is designed to control the electricity flow to prevent such things from happening. One of the methods of stopping the excess electric flow is to trip a breaker or blow a fuse. It is absolutely essential to your safety that you have a properly functioning electric panel and circuit breakers that will trip should too much electricity start flowing. It is important your electric panel is big enough to handle the amount of electricity you need in the house. If you add a large appliance or something like an air conditioner, you may need a panel upgrade. The bigger panel is necessary to handle the extra electricity demand. An electric panel may be called many different things. Below are the terms that are associated with electric panel. There are a couple of reasons that will likely require you to upgrade your electric panel or what is sometimes referred to as your service panel. Brown Electrical Solutions can provide you with a 100 amp panel upgrade.